According to Eurostat statistics on waste released on 22/03/16, each European generated 475 kg of waste in 2014, only 44% of this is being recycled or composted. The remaining 56% ended up landfilled (28%) or incinerated (27%). In general terms, the countries which are performing well in waste treatment seem to be unable to reduce their waste generation, while the most efficient ones in terms of waste generation tend to be unable to reintroduce materials into the economy through recycling and composting. In view of these facts and in order to advance towards a circular economy ZWE calls for the adoption of targets for residual wastei of 100kg per capita as a more effective tool to increase recycling in countries with low waste generation and reduce waste generation in those countries with advanced recycling programs. Zero Waste Europe’s Executive Director, Joan Marc Simon said “A residual waste target of 100kg per capita for 2030 is a good indicator of resource efficiency and resource use, as it works on the top levels of the waste hierarchy, effectively combining prevention, reuse and recycling policies”. 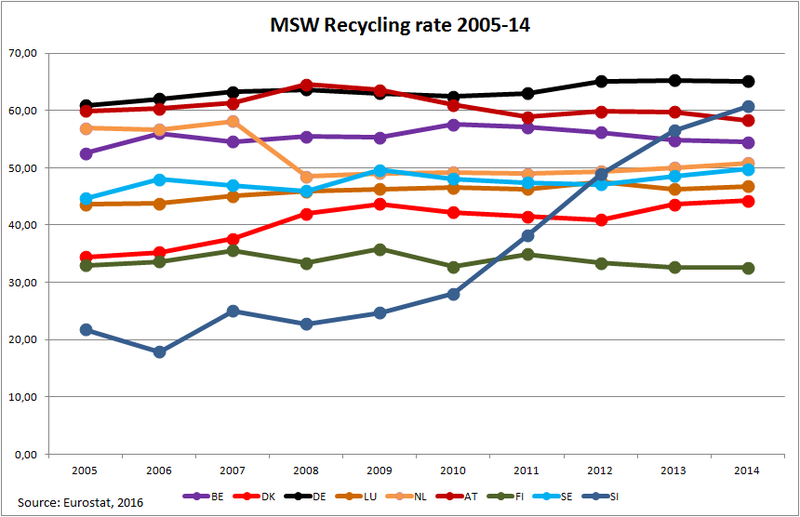 When looking at 2014 statistics from a residual waste per capita perspective one can see that, besides Malta and Cyprus (both islands) and Denmark, there is already considerable convergence between EU member states with the EU average being at 259kg per capita, hence a target of 100kg for 2030 is a feasible target. 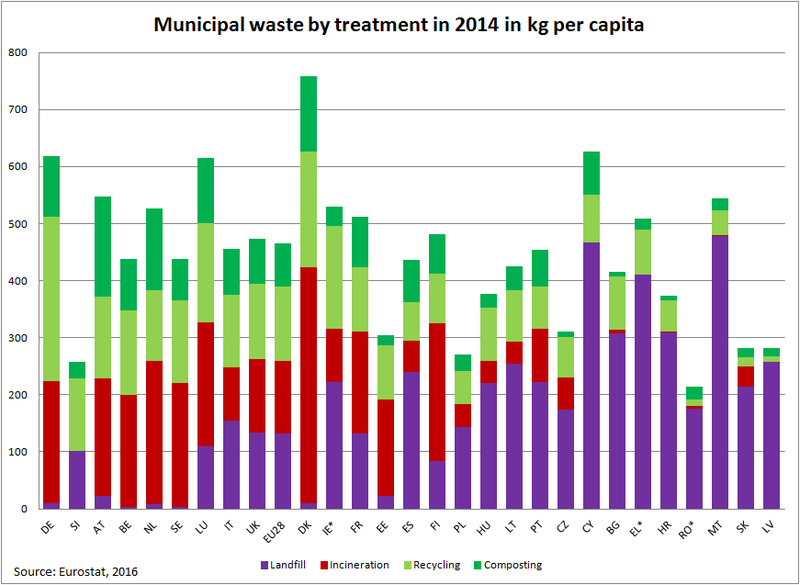 The situation is, however, very diverse across the EU, both in terms of waste generation and waste treatment. Some Member States like Romania, Poland or Latvia are well under the average EU waste generation with less than 300 kg per inhabitant, while some others like Denmark, Cyprus and Germany generate substantially more than EU average, being over 600 kg per inhabitant and even over 750 kg, as it is for Denmark. ZWE also notes that Slovenia, a relatively new member state, is today the best EU country implementing waste hierarchy management practices with stable waste generation well below EU average and a high recycling rate. This makes of Slovenia the best performing EU country with the lowest amount of residual waste, just 102 kg per capita in 2014. Mr Simon added that “The Circular Economy in Europe means reducing waste generation and increasing recycling rates and Slovenia is a good example of how to both things can take place simultaneously”. But, in which group was Anaerobic Digestion included in all of this and what were the figures, please? As the UK Defra rightly states: AD is preferable to composting since it produces both (excellent) fertiliser & energy! But, why do so many countries and local authorities (yes, in UK too!) ignore this? Hopefully, ISABEL will discover the real and potential reasons to be changed? Why do we not only waste these raw materials but the available processes as well, and ‘shoot ourselves in the foot’? I have another question too: Just how do you define ZERO WASTE, please? I hope you do not tell me zero going to landfill, since that is NOT zero waste!!!!!!!!!!!! Hi Brian! Thanks for asking an important question. You are absolutely correct when you say that zero waste to landfill is NOT zero waste, when Zero Waste is defined in this way it inevitably drives waste to incineration, which is absolutely not an acceptable scenario. If you want to find out more about what we mean when we refer to Zero Waste please have a look at our ‘Zero Waste?’ page. This is why we use the slogan ‘No Burn, No Bury’. Matt, Zero Waste Europe, communications & programmes officer. Spricht hier jemand deutsch von Ihnen? Ich suche Kontakt nach Bulgarien und Rumänien. thanks for your question concerning AD. We’ve followed the same logic as EU directives, i.e. considering anaerobic digestion as composting (thus material recovery) as long as the digestate is used for composting.